One Christmas a few years back, my husband, Jesse, and I were in charge of organizing a holiday staff party. We encouraged the guests to bring gifts (toys, food, and blankets) for homeless animals, which were to be donated to local animal shelters. I was to play Santa and deliver the goods. One stop I made was to a Rhode Island city shelter. After unloading my boxes of donations, I forced myself to walk through the rows of kennels, wide-eyed and deafened by the plaintive barking of more than twenty dogs. I kept being drawn back to a sweet little female pit bull in one of the last cages. When I inquired about her, I was told that she, along with the male beside her, was to be "put down" in a day or two. Their time was up, and no one had shown interest in them. The next day, I coerced a friend down to the shelter, and we adopted both dogs. Jesse and I kept the male, and our friend kept the little female.We thought she was still pudgy from puppyhood, but actually she was pregnant. She delivered nine healthy puppies. We adopted the scrawny runt of her litter, which gave us a total of three dogs in our urban third-story apartment. My husband made me promise to stay away from animal shelters. The following year, I began photographing and writing, pro bono, for a new regional monthly called The Animal Print. One of my first assignments was to interview Katenna Jones, a Brown University graduate student and the director of Brown's Canine Behavior Program, which had been funded by a private grant. The aim of the program was to teach volunteers how to train dogs who were in animal shelters, and determine whether such training affected the adoption and retention rate of those animals. Ms. Jones and her student participants found that there was a strong trend indicating that animals who were trained and socialized and who received regular exercise were adopted more quickly and retained longer in their new homes than animals who received no interaction or training. After writing the piece, I suddenly felt very tied to the program. I decided to volunteer under Ms. Jones's watch. It was only one hour a week at first, and I took comfort in her strength and dedication. She was empathetic when I became emotional, but she always directed me back to the work. Jones gave every dog a name, taught them new tricks as well as trust, knew their habits and preferences, and then pleaded for their lives to be spared when all of the kennels became full. The first time that a dog I had been working with was euthanized, it was devastating. Unfortunately, it is an inevitability that I have now had to face dozens of times. Like most shelter workers, I have found a private way to mourn. All of the animals we worked with had been abandoned or lost by their owners. They were rarely neutered or even wearing identification. Very few were ever reunited with their owners. Some dogs had been beaten or severely neglected. Others had been handed over simply because it was no longer convenient for their owners to keep them. Ms. Jones taught us to do temperament evaluations, to estimate age, and to teach basic obedience. Most dogs love to learn, to have a "job," and I am always amazed at how proud dogs seem after learning a new trick. Eventually, Ms. Jones's grant ran out, and she accepted a full-time position at a different shelter, where she could continue her work. Her student volunteers either graduated or moved on, leaving me and one or two other people. I felt I had no choice but to stay. As a photographer, I was soon asked to begin taking photos of all the dogs for records and for internet adoption sites. As my files grew, I realized that many of the dogs whose pictures I had in my archives never made it out alive. Despite our efforts, many dogs had to be euthanized simply to make room for the dozens more brought in every week by Animal Control. I found that no matter what, I couldn't bring myself to delete their photographs, which in some cases were the only record of their existence. A few months later, I decided to begin creating true portraits of these dogs. From day one I conceived of this project's becoming a book, a body of work that would help document and memorialize some of the beautiful, intelligent animals I meet in shelters. 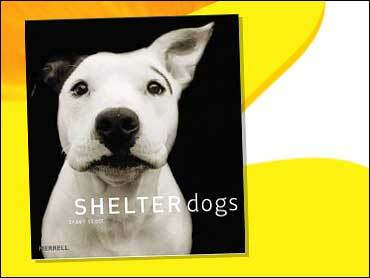 A group of fifty or so would represent the millions who die each year in animal shelters nationwide. I was never interested in making images of desperate dogs behind bars. While photographs of that nature are valid as a means of illuminating the situation, I feel they evoke little more than pity in the viewer. I wanted to strip away every environmental element and create dignified individual portraits that presented each dog's unique personality. By singling them out and temporarily raising them above their statistical status, the issue is made much more personal. When people view these images, they are often locking eyes with a captivating being who has been cast aside, abused, or left behind. To me, these are portraits in the simplest and truest form. I had to do very little. My subjects were already beautiful, animated, and ready for their close-ups.